If you are working on a Vectrex game or hardware project and there is an important update, please contact us so we can post your news here on the VecNews page. Much of arcade Asteroids’s allure is the glowing, minimalist vector screen. Instead of a standard TV monitor, which scans from top to bottom over and over again, the vector display draws straight lines from one point to the next where needed, like an oscilloscope. 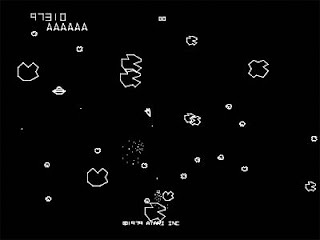 It can only be a simple polygon outline of one color, but it also means that the image is sharp and bright (Asteroids’s photon torpedoes leave a brilliant trace along the slowly-decaying phosphor of the screen), and simple to program (the video and sound data in the arcade version of Asteroids is just 2 KB of ROM code, and the game program is another 6 KB). It’s why www.atariasteroids.net have the Asteroids locator on the site: to this day, no home version or variation of Asteroids really does the same thing. Lets get into Details ! "This is a great system - ahhhm - if you are a retro collector like i am - then I recommend buying it..."
From us 100 Points ! This young man will become a TV reporter. These Baseball caps are a limited edition run of 50 only, I had Commissioned celebrating 30 years of the Vectrex arcade system which will be shipped out in the first week of March, taking pre orders now. They are very high quality black, fully embroidered Baseball cap with four embroidered Logos, which includes the Vectrex logo on the front in pale blue (Vectrex colour), and "real arcade play" embroidered underneath on the back is the MB emblem (blue & red colours), plus on both sides of the cap are MineStorm graphics in white, Left side the MineStorm laying UFO, right side 3 Mines and your Ship which are accurately represented. The caps sell for £23 (Approx. 36USD), which includes shipping worldwide, each cap is posted in a Jiffy bag with the cap packed out to retain its shape during shipping. Quoting Travis Morgan: I thought you might be interested in this track I composed. I'm sure you are familiar with Spike. 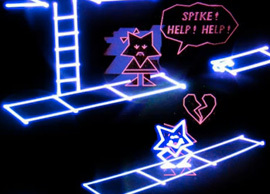 When I was a kid I used to play "Spike" on my father's Vectrex. Yesterday Martijn Wenting of Revival Studios announced a competition for his game Debris Revisited. See a demo at www.youtube.com - we love the sounds ! announce a highscore contest for Debris Revisited. When is the deadline? 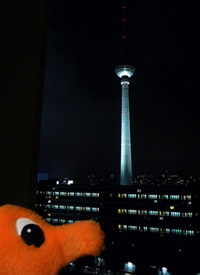 : The deadline for this competition is set at July 1st 2011.
as well as for the highest score in astrododoge. 1. A rare VIP edition of Debris Revisited (only 20 copies released! 3. Any revival studios game of choice. Bonus prize for the highest score on astrododge: Any revival studios game of choice. - Just play a game of Debris Revisited, and get a good score. For your reference, the highest score at the time of writing is around 30000 points. Good luck! 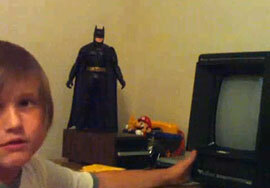 I started getting into Wikias several months ago, and seeing that there wasn’t one for the Vectrex, I started my own! BTW, for those that are confused as to the difference between Wikipedia and Wikias (as I’ve been asked that before), individual Wikias are geared towards one subject in particular, such as Star Wars, Star Trek, reptiles, the Glee tv show, cooking, etc. Also, Wikipedia forbids certain information for gaming entries, such as not noting how many points is required to get to a next level, an entry can’t be written like a guide, score tables should be omitted, etc. With a Wikia though, you can do all of this and more! 300 Baud Magazine - issue No.1 OUT NOW! 300 BAUD MAGAZINE is a print-only publication aimed squarely at retrocomputing enthusiasts. We contributed an article about the Vectrex in issue #1! Covering everything from the glory days of the mainframe to the home computer revolution, 300 BAUD contains an entertaining and informative blend of expert opinion, enthusiast ramblings and archival tidbits. A marvel that is - 300 Baud Magazine - the newest retro computing magazine, this side of the 21st century. 300 BAUD is 100% volunteer operated by people who care about dusty old computers.